In the framework of the normal activity of Albanian Society for Trauma and Emergency Surgery and following the great success of 2nd Annual Albanian Congress of Trauma and Emergency Surgery 2018, in Ohrid Macedonia, the society’s general assembly meeting was organized. The meeting was held on October 26, 2018 at 15:00 . The quorum of the society headed by President of ASTES Mr. Agron Dogjani was present. Board members and society’s members were also present during the meeting. Evaluation and detailed analysis of ASTES activity from ACTES 2017 to ACTES 2018. Updating executive and organisational structures of ASTES. Approval of society’s annual financial activity. 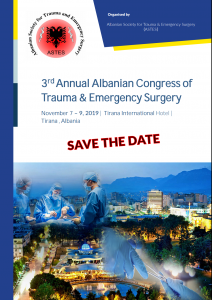 Assignment of the organizing group 3rd Annual Albanian Congress of Trauma and Emergency Surgery 2019.